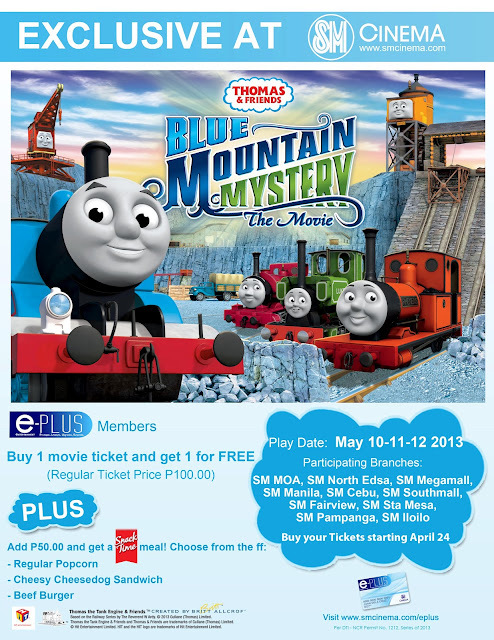 Catch Thomas and Friends Blue Mountain Mystery, an SM Cinema Cinexclusive title showing May 10, 11 and 12 at select SM Cinema branches. With a regular movie ticket price of Php 100.00, e-PLUS members may enjoy the special Buy 1 movie ticket-Get 1 ticket FREE promo for this movie. What’s more, e-PLUS cardholders may choose to add Php 50.00 and get any of the following Snacktime meal: Regular Popcorn, Cheesy Cheesedog Sandwich or a Beef Burger. Tickets to Thomas and Friends Blue Mountain Mystery will be available starting April 24 and may be watched in the following participating SM Cinema braches: SM Mall of Asia, SM Megamall, SM North EDSA, SM Cebu, SM Fairview, SM Iloilo, SM Manila, SM Pampanga, SM Southmall and SM Sta. Mesa. To know more about e-PLUS, visit www.smcinema.com/eplus or call the SM Customer Care Hotline at 470 2222.